Local vintrace Administrators have powerful tools for managing subscriptions and licenses, including adding new system users. Now you don’t have to contact VINX2 support to have new accounts set up for you. Click here for “Managing your subscriptions and licenses” article. First, request the new system user license per the above article. Note: If you have deactivated any system users accounts, you may be able to swap an inactive account for a new one. Next, go to the Address Book (the Rolodex at the bottom of the screen). Click the Add button in the lower left corner and choose “System User”. Fill in the user’s first and last name, email and phone number. This information is helpful to the vintrace support staff in communicating with winery staff. Note the permissions on the right. Click here for information on what each permission allows; includes the default permissions. Note: Users may change their password at any time: go to Tools – Change Password. As the local administrator, you can’t recover a lost password, but you may change the password. 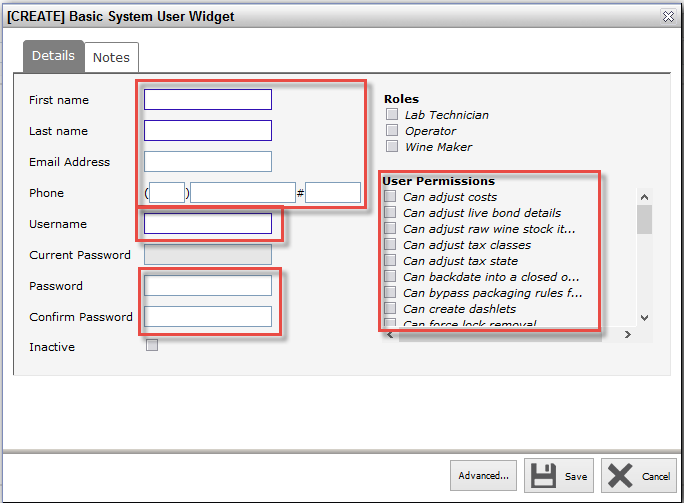 You have the option of setting up generic accounts based on roles within your winery; for example, LabTech1; Cellar1, Cellar2, etc. These are very useful for seasonal employees or other positions that tend to have a higher turnover rate. You only need change the password to allow the new user access, while denying access to the old user. When you are satisfied, Save. You might want to log out as yourself and try logging in using the name and password for your new user.